Santiago Mejia Ortiz - Book a consultation instantly! Santiago Mejia Ortiz, specializes in Airport and Aviation Law (Contracts, Regulations and Compliance. Government Relations). Santiago Mejia Ortiz, has various degrees of specialization in Airport and Aviation, having worked for the Institute of Civil Aviation of the Dominican Republic in the Legal Department. In 1998, after the Dominican Republic's government held the granting of the Concession for 4 major international airports in the country, Dr. Santiago Mejía was Executive Assistant to the Commissioner for the Implementation of the Concession Agreement, the transitional body created to undertake the transition and implementation of the Concession, from which participated in the coordination process between the State and the Concessionaire for the transition of the operations of the Airports. 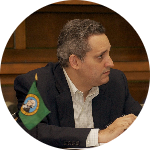 Santiago Mejia Ortiz, have been legal counsel for the Concessionaire since 2000, during which he´s been in charge of contract drafting and discussion, goverment relations and consultations for the Concession Agreement. He´s also legal counsel for international airlines operating in the Dominican Republic. Since September 2012, Santiago Mejia is teaching Aviation Law in Universidad Iberoamericana (UNIBE). He is also an Arbitrator in the Alternate Dispute Resolution Center in Camara de Comercio y Produccion de Santo Domingo. He has vast experience in Contract drafting and negotiation, including construction, professionals services and administrative contracts, as well as Corporate Transactions, M&A, Assets Purchases, Reestructuring, Shareholders Agreements, etc. He also practices in Intellectual Property and Corporate Law in general. Specialties: Aviation and Airport Law, Contracts, Intellectual Property, Corporate Law.